Figure: The osculating eccentricity plotted against the sine of the osculating inclination (relative to J2000 equinox and ecliptic) for the orbits of the first 100,000 numbered asteroids at MJD55400. Raw data from JPL Small-Body Database. The parameters, and appearing in Equations (10.100)-(10.103) are the eccentricity and inclination, respectively, that the asteroid orbit would possess were it not for the perturbing influence of the planets. These parameters are usually called the free, or proper, eccentricity and inclination, respectively. Roughly speaking, the planetary perturbations cause the osculating eccentricity, , and inclination, , to oscillate about the corresponding free quantities, and , respectively. 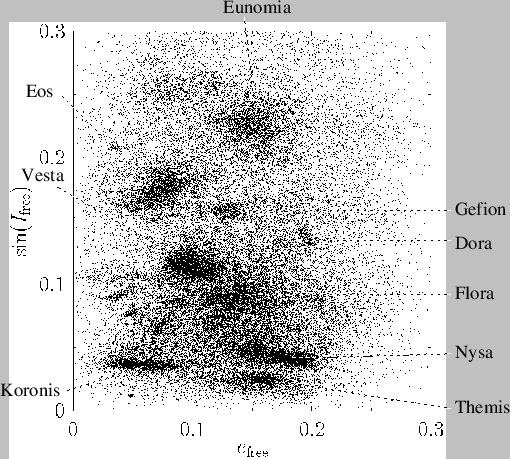 Figure: The free eccentricity plotted against the sine of the free inclination (relative to J2000 equinox and ecliptic) for the orbits of the first 100,000 numbered asteroids at MJD55400. The free orbital elements are determined from standard Laplace-Lagrange secular evolution theory. The most prominent Hirayama families are labeled. Raw data from JPL Small-Body Database. 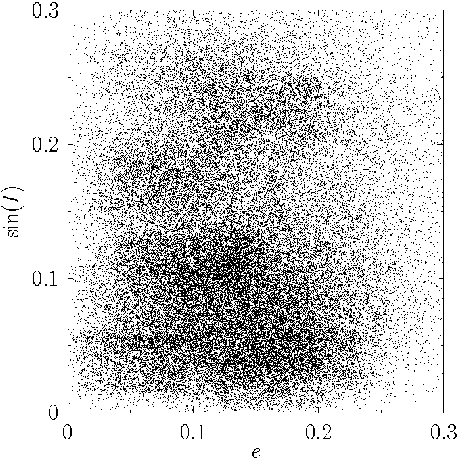 Figure: The free eccentricity plotted against the sine of the free inclination (relative to J2000 equinox and ecliptic) for the orbits of the first 100,000 numbered asteroids at MJD55400. 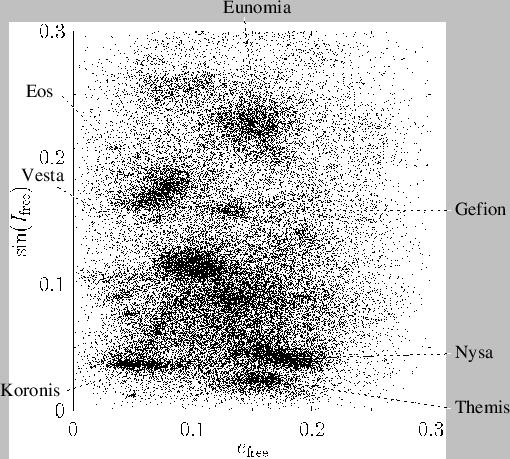 The free orbital elements are determined from Brouwer and van Woerkom's improved secular evolution theory. The most prominent Hirayama families are labeled. Raw data from JPL Small-Body Database.